Oakfield Historical Society – Preserving Local History! Welcome to the Oakfield Historical Society Museum. We are so excited to finally have found a home! Our museum has 5 rooms that are open to the public. We change our displays every year during our “down time”. We are reopening for the season on Saturday, April 21st at 11:00. This years displays are OACS through the years. We found some wonderful artifacts including long lost FFA albums from the late 50’s and early 60’s and the original banner. Oakfield has not had FFA for many years but it started back up in 2017 and is a joint group with the Elba school district. 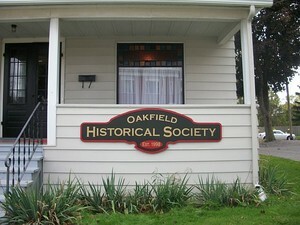 The Oakfield Historical Society meets the first Tuesday of every month -EXCEPT January & February due to winter weather and we do not have a meeting in July. We do however have board meetings in January & February. We are a non-profit organization, and do have a 501C3 for those who would like to make a donation. We appreciate your support! We are looking forward to expanding our membership!